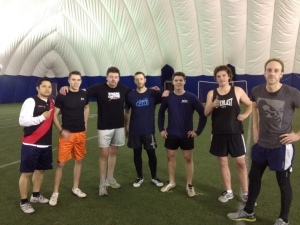 A couple weeks ago, before the haze of St. Paddy's Day weekend and the various DCC trainings, the Toronto Dingos wrapped up their 2nd Annual Winter Indoor League held at the illustrious UCC Training Dome in Toronto, Ontario, Canada, North America, World, Solus, Milky Way, Virgo Supercluster, Known Universe (what up, Orion). Despite a tough run in the tourney for Team TB, the Bridesmaid Final was by far their best game of the competition as they held close to Team Spider for three quarters and challeneged their rivals at every turn. Unfortunately, the wheels came right off the wagon in the 4th, as a couple quick goals from Team Spider in the first minute of the 4th put the game out of reach, afterwhich the proverbial floodgates opened up for a 6-goal frenzy. Despite a bit of rough, sling-tackle, T-shirt tearing play, the match ended on amicable terms, and there are hopes that players on both teams will indeed be able to join forces under the Red and Black flag in the coming OAFL season without significant issue. For THE MAIN EVENT, some friendly jawing and taunting pre-game seemed to ignite both sides, as the rules of safety and soft tackles went right out the window in a furious four quarters of footy. Team OB gained the early advantage with some great run out of their rovers in the middle, but an inspiring effort from Team Shaun in the 2nd and 3rd - putting together a 6.1 vs. 1.5 scoring line over those frames - forced Team OB to play desperate, taking risks ill-suited for the close-quarters Dome footy and sealing the deal for the Shaunigans. Of note was the play JV and Mal through the middle, who seemed to be constantly open, and the heart-on-his-sleeve style of Shauny himself, who was key in the 2nd-quarter turn around. Congratulations go out to Team Shaun, who's wrested the Indoor League crown from "teams with Jimmy" with a flawless 4-0 record. 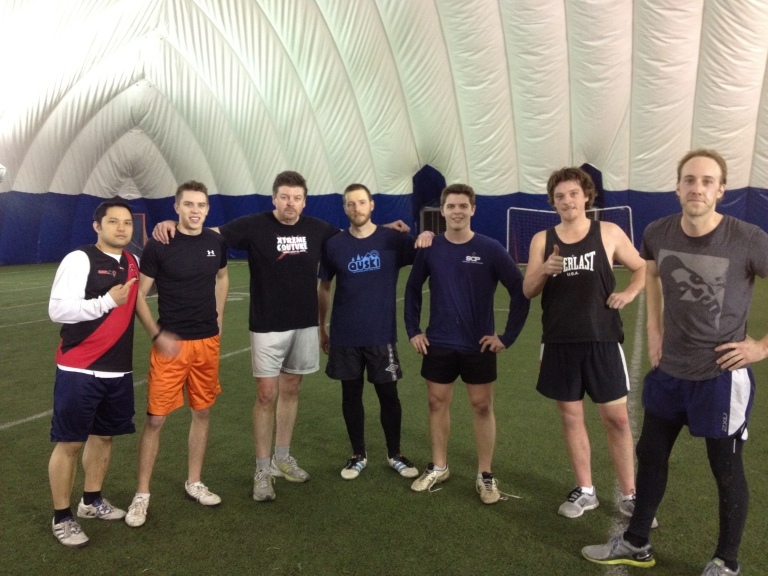 But more importantly, a big congratulations goes out to all rookies and new players, who showed incredible progress through the indoor trainings as a whole and bought in to the Toronto Dingos spirit with style. Winners and losers aside, if there's one lesson to be taken away from this whole affair it's that the Dingos look hungry this season, and are sure to make life tough for the other clubs in the coming 2013 OAFL Season.